Have you knitted a slouchy hat yet? 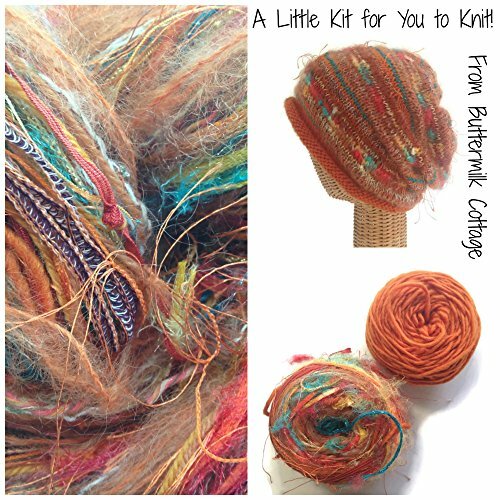 Here's a great kit to get you started that includes the solid orange yarn for the rolled brim and crown, the vibrant boutique yarn, FUSION and my own pattern! To complete the kit you will need a Size 9, sixteen inch circular needle, Size 9 DPNs, a tapestry needle and one stitch marker. This color way is created with a warm shades of orange with a vibrant pop of teal. Fibers included in this yarn are wool, mohair, cotton, rayon, metallic and ribbon. All my boutique yarn is created by me. It is made of a collection of a dozen or more different yarns. These yarns are cut into specific lengths and then hand tied together, creating a finished unique yarn. Kit includes yarn and pattern to knit a slouchy hat. Boutique, artisan made yarn in orange color way. Finished hat is one size, Woman's medium, with plenty of "give." The yarn pictured in this listing, is the yarn you will receive. The hat pictured is representative of the color way and not necessarily knitted from this particular color lot of the boutique yarn. View More In Knitting Kits. If you have any questions about this product by Buttermilk Cottage, contact us by completing and submitting the form below. If you are looking for a specif part number, please include it with your message.